Red Dead Redemption 2 devs talk about what most sets it apart from GTA 5: "It’s the sense of life"
Not only is Red Dead Redemption 2 one of our most anticipated new games of 2018, it's Rockstar's first game built exclusively for the latest generation of consoles. That sounds almost absurd, since these consoles have been going for five years and GTA 5 did come out for PS4 and Xbox One (where GTA Online has continued to flourish for years). But those were still just upgraded versions of a game that was originally built for PS3 and Xbox 360, with the associated constraints. So what has Rockstar done with all that power, now that it isn't working on a framework of video game hardware from 2005? A little bit of everything, according to Rockstar San Diego art director Josh Bass (via The Hollywood Reporter). 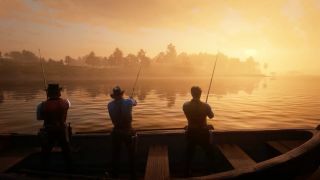 "Red Dead Redemption 2 is our first game for the latest generation of hardware, and was an opportunity for our teams to upgrade every single aspect of our approach to game design at once, from graphics and lighting to AI, to weather, sound and score, facial and body animation and more," Bass said. "We have used that power to create a world that goes far beyond anything we have ever done in terms of depth, interactivity and persistence." And that sounds really cool, but it's still abstract. Especially since you can download mods for GTA 5 that make it look freakishly photorealistic - all the work Rockstar's done across five years or so has to go deeper than that, right? Rockstar North art director Aaron Garbut helped put it all together in one of those lofty-yet-believable answers that fills your head with possibilities. "It’s the sense of life the game has that most sets it apart," Garbut said. "When you first enter a town and you see the townspeople going about their business, building houses, selling papers, hanging out, you can instantly tell that we’ve never experienced this detail in an open world game before. Where you see a a shack on a hill and you know there is something interesting for you there, maybe you will break in and stumble onto a mystery, or meet the owner and end up getting tangled in something. I think that’s when you can tell that it's new territory, when you are not even sure if what you’ve done was a mission or not. When all the systemic parts of the world come together with our scripted content in the right ways, it’s kind of incredible." Ultimately, Garbut wants players to forget they're in a game for a while and just leave "with a memory of a place." Until they go on a massive crime spree, make everybody in the world hate them, then reload their save. C'mon, I know I'm not the only one who plays all of Rockstar's games that way. Need some outlet for your open-world western hype? How about a Red Dead Redemption 2 bottle opener and dominos set?